The first meeting of Sealaska Heritage Institute’s Southeast Regional Language Committee began Friday morning with traditional introductions by the committee’s three members: Lance Twitchell, who spoke in Lingít (Tlingit language), Gavin Hudson, who spoke in Sm'algyax (Tsimshian language), and Benjamin Young, who spoke in Xaad Kíl (Haida language). 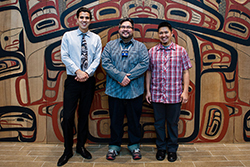 Hearing the three young men express themselves in Southeast Alaska’s indigenous languages was an uplifting way to begin, said SHI President Rosita Worl. All three committee members expressed excitement about working together to build knowledge of Southeast’s indigenous languages. Earlier in the week, Hudson offered these words in Sm'algyax . SHI established the Southeast Regional Language Committee to help steer a major new program, the Haa Shuká Community Language Learning Project. Worl said the committee’s formation marks an important milestone for SHI’s language revitalization efforts, which extend back nearly 20 years. When SHI’s language program was established, she said, Southeast’s indigenous languages were described as “moribund,” (death-bound), a label SHI rejected, and some elders were reluctant to teach their children and grandchildren, having been traumatized by their own experiences. Inspired by the successes of Native Hawaiian speakers, and supported by the dedication of a growing number of young learners, SHI’s language programs have come a long way, Worl said. The new project, which is funded by a grant from the Administration for Native Americans, will pair fluent speakers of Lingít, Xaad Kíl and Sm’algyax with intermediate and advanced speakers in those languages in the communities of Metlakatla, Hydaburg, Sitka and Juneau. Project partners include the Sitka Tribe of Alaska, the Haayk Foundation, and Hydaburg City School District. SHI will also organize monthly language events and biannual immersion retreats in each partner community that will be open to the public. Lance X’unei Twitchell grew up in Skagway and now lives in Juneau. He is of Tlingit, Haida and Yup’ik heritage and carries the Tlingit names X’unei and Du Aani Kawdinook and the Haida name K’eijáakw. 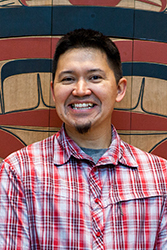 Twitchell is currently an Assistant Professor of Alaska Native Languages at the University of Alaska Southeast and has been teaching the Tlingit language since 2004. He is also a doctoral student of Hawaiian and Indigenous Language and Culture Revitalization at Ka Haka ʻUla o Keʻelikōlani College of Hawaiian Language at the University of Hawaiʻi at Hilo. His studies are in creating safe language acquisition spaces and achieving revitalization through counterhegemonic transformation, which means a rejection of external definitions and fragmentation and a promotion of the thought world of the ancestors of language movements. He recently completed a Tlingit language workbook based on the teachings of Richard and Nora Dauenhauer, scheduled for release through Sealaska Heritage in early 2017. His grandfather, Silas Dennis Sr. of Skagway, was his first teacher. 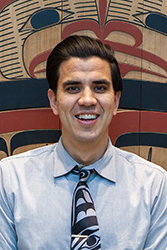 Gavin Hudson was born and raised in Metlakatla. He graduated from college in Seattle in 1998 and moved back home in 2010. His Tsimshian name is Huk Tgini’its’ga Xsgiik and he is a member of the Laxsgiik Eagle Clan. Hudson is one of three founders of the Haayk Foundation, along with David R. Boxley and Kandi McGilton. The nonprofit’s mission is to preserve, promote and revitalize Sm'algyax, Ayaawx (traditional Tsimshian values and protocol), Adaawx (true history), and Luulgyit (validating cultural practice) in order to cultivate a positive and healthy identity for the people of Metlakatla. Although he is not yet a fluent speaker, Hudson has logged hundreds of hours working with fluent speakers and is proficient in reading, writing, and transcription in Sm'algyax. In 2016, as Project Coordinator for the Tsimshian Education Achievement Model grant project, Hudson helped to create the Wap Lip Algya̱g̱m House of Our Language 0-3 Years Sm'algyax Curriculum. Hudson is also a Tribal/City Councilman at Metlakatla Indian Community. Benjamin Young was raised in Hydaburg and now lives in Ketchikan. His Haida name is K’uyáang. He is a Raven of the Yahgw’láanaas Clan. Young learned Xaad Kíl from his grandfather, Claude Morrison Kúng Skíis, a respected Haida elder who lived to the age of 100. As a teenager, Young taught his first language classes at SHI’s Latseen Leadership Academy. Through other language projects and programs, Young has worked with elders Woodrow Morrison, Alma Cook, Annie Peele, and Erma Lawrence. Over the years he has also been influenced by linguist Dr. Jordan Lachler and Gwich'in instructor Hishinlai' Peter. Young graduated from Butler University with a degree in secondary education and began teaching in 2014. He has had many additional roles in language revitalization such as language mentor, researcher, and curriculum developer. 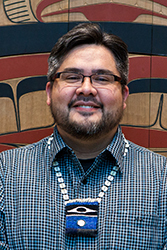 Young has also served as a cultural specialist with SHI, the Xaadas Kíl Kuyaas Foundation, and the Ketchikan Indian Community, among other organizations.